Re: The Rat Stash - CONTEST for New Design Name & 6 Bungalows Available!!! Oh noes! I didn't realize til after I posted that i had repeated the same idea already given! I wish you and yours the best of health! Hello! Good vibes for Minx recovering from her spay! I'd love to get a new design hammock for my boys out of the #16 ghoul print, if you have enough when it's my turn - can you tell Halloween's my favorite holiday? Hugosmom: I have quite a bit of that fabric so I don't think it will be any problem. Thanks so much for the good thoughts for minxies spay. We leave a little before 5am tomorrow and the anxiety is really starting to kick in. Literally everything has gone wrong in terms of getting this done, so I'm hoping if she's not supposed to have the spay due to something bad happening, the car will break down on the way or something. Doesn't it figure that the spay would be scheduled for the same day the contest ends, I'm going to be a mess all day... Thanks so much for thinking of her though, and hopefully this time tomorrow we'll be on our way home happy as clams. Re: The Rat Stash - CONTEST for New Design Name & 5 Bungalows Available!!! Minxie's made it through her spay! Thanks to everyone for all the encouragement & support. She's resting quietly in her travel cage, & that's everything we could ask for after a week like this. Also, just a reminder to everyone that the New Design Name Contest ends Tonight at Midnight, so get those last minute votes in! We also added some New Fabrics to choose from for custom orders, so please let me know if you would like to be added to the wait list for custom orders (first come, first serve for fabric availability). majikbabygirl: I'm sending you a PM to make sure you still want the frog bungalow (as I've just added new frogs, monkeys & mice to my available fabrics!). Let me know if you'd like another design instead! Here are a few new available fabrics: See All Fabrics Here! Re: The Rat Stash - CONTEST for New Design Name & 4 Bungalows Available!!! 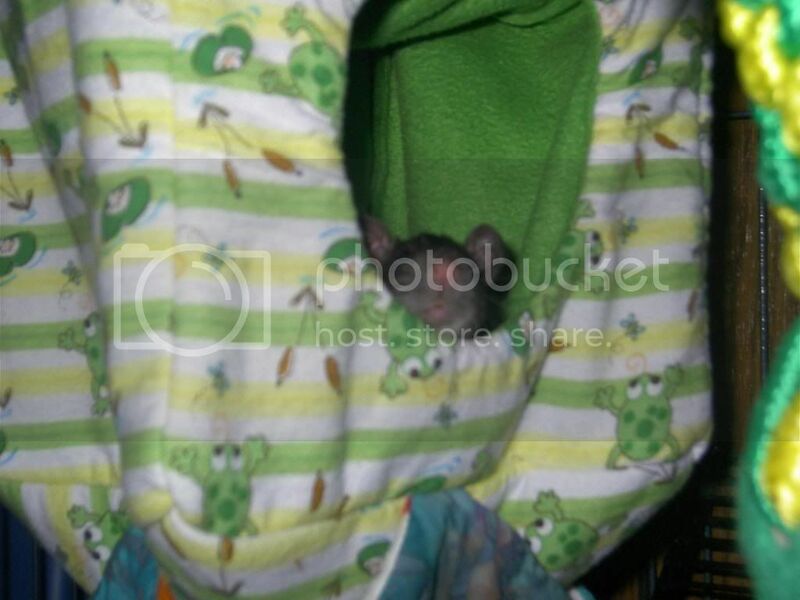 rattie_abbi for suggesting "The Cozy Cavern"!!! Rattie-Abbi: I absolutely adore the name, & think it fits the new design perfectly! Congratulations, you've just won a free hammock of any design of your choice! Please let me know if you want a premade, or if you want to design your own from our available fabrics. I will PM you as well to see what you would like. Thanks again for such a great name! I also wanted to note my thanks for so many responses. We were overwhelmed with choices, but I just wanted to note that 3 other people made it very hard. We struggled between Cavy Carnage's "Happy Camper", HugosMom's "Ratty Buddy Bundle", & let me just tell you, AnimalHobby really put us in a twist with "The Wedgy". Seriously, if I wasn't afraid of people being funny enough to let it hinder sales, you would have had it in the bag. I thought it was fantastic. But that's me I would like to offer all three of you $3 off your next order if you'd like! OK everyone, Cozy Caverns are now officially available!!! Anyone who would like to be on the wait list for any custom fabric orders, please let me know & I will add you on. -which type of hammock/hammocks you would like to order. -If you want a premade or a custom fabric hammock. Cube Hammocks: let me know which fabric you would like for sides - top/bottom - front/back - or a different choice for all 6 sides! Bungalows: same as cube hammocks, but you can also choose your fabric for the bungalow bottom! Thank you so much for choosing my name There were many hard choices out there and honestly, I did expect to win at all! I'll be pming you shortly with my design and fabric choices. Your designs are all so original and fun that I don't know which one to choose from! 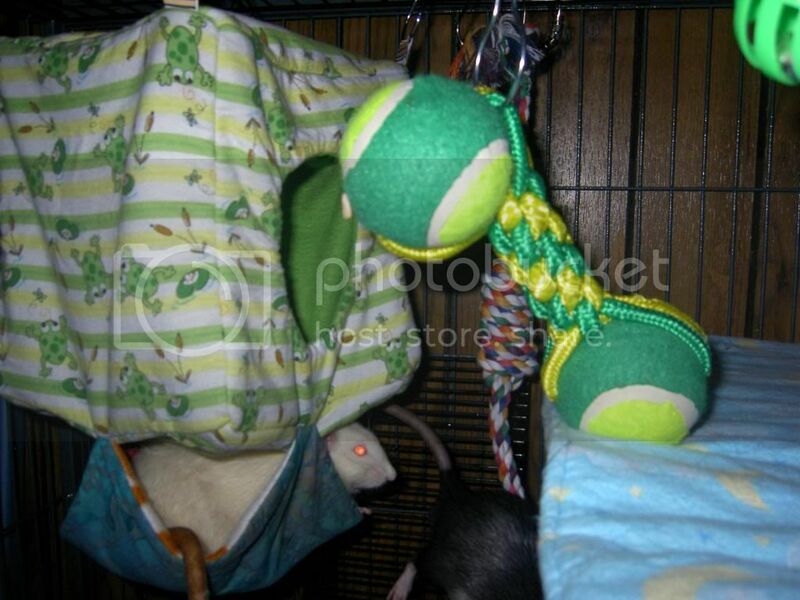 RattiAbby: You can absolutely have that one if you'd like it. Just PM me the shipping address & I will have that right on out for you! Re: The Rat Stash - New Cozy Caverns & 4 Bungalows Available!!! Oh my goodness! That is so much better than my poorly sized one. If you could somehow get my red ratstash logo (from the top of the main thread) in there, it would be absolutely perfect ... but even as is, it's a great step up! Thanks so much, and your orange flower hammock will be on its way shortly! ONce it's shipped, how long do you think that it will take to arrive? My boys and I are so excited! I ship all items via first class mail, so it should take 3-4 days. It will be in the mail monday (as the post office here is closed already) so your boys should have it by the end of next week. Can't wait to see how they like it!!! & thanks again for the banner (the second one isn't quite what I want, but I really like the first one so thanks so much! Marie, Oh my goodness!!! That is one of the cutest photos! & you know, that is the very first time I have been able to see any rats in a bungalow! (I haven't even seen my rats in one yet). You've got to let me steal that one for my website. That is just too cute to pass up. By the way, I don't even know what your rats names are yet...How can that be? Oh please do. Im gonna get some more cute ones for ya! I just found it funny that I didnt even get to finish hanging it and they were in it lol. My boys names are all at the bottom but that is Merlon in the cube and Whiteout in the bottom of it. I love the name Whiteout! And is Coppers reddish brown in color?